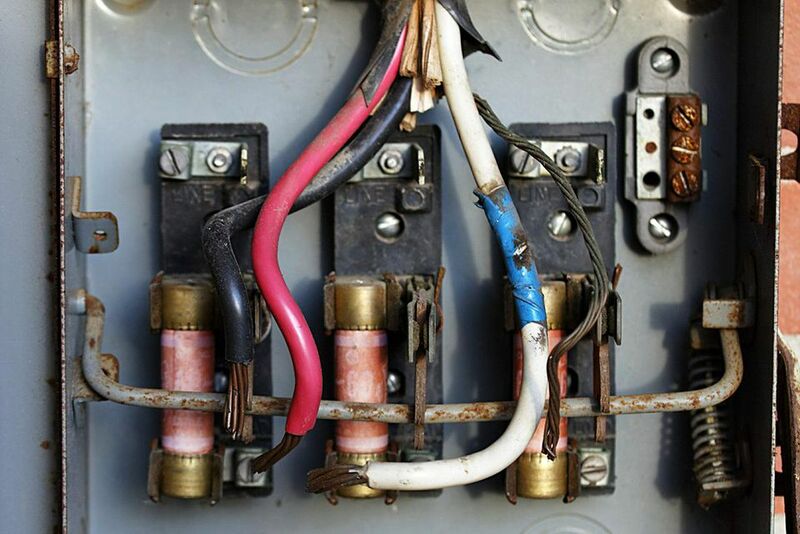 When you have an electrical problem in your home but don't know what it is, your first response is likely to investigate the electrical service panel, also known as the fuse box or the circuit breaker box. You might find that a fuse has blown or that a circuit breaker has tripped. Either event is the result of your electrical system working correctly. When an excessive amount of electricity surges beyond the capacity of your electrical system, circuit breakers or fuses act as safety devices to immediately cut the flow of electricity. If those electrical surges were allowed to flow unhindered, they may start fires at the service panel or other areas of your home, extensively damaging your property and putting you and your family in grave danger. When an electrical error occurs, a large current flowing through the fuse or circuit breaker will open the circuit, blowing the fuse or tripping the breaker. Looking through the sight glass of the screw-in fuse (plug fuses), you will notice a blackened glass if the fuse was blown. In the case of a cartridge fuse, there is likely no physical sign, as this fuse is concealed. But if you are able, test it outside of the circuit with an ohm meter or continuity tester to see if it is blown. For a circuit breaker, the horizontal switch on the breaker will be pointing toward the outer edge of the service panel when it is turned off. Often, the cause of these tripped circuits or blown fuses is either a short circuit or a ground fault. While the terms may sound similar, they are different electrical events. In order to learn the source of the trouble, it is necessary to know the difference between a short circuit and a ground fault. Additionally, knowing some of the common causes of short circuits and ground faults will help you avoid having this problem occur in the future. Short Circuit: A short circuit occurs when a hot wire carrying a current and a neutral wire touch each other. When this happens, a tremendous amount of current flows, causing a fuse to blow or a circuit breaker to trip. Sparks may fly and pop, and there may even be a small fire and smoke accompanied by the smell of burning plastic. Ground Fault: A ground fault occurs when the hot wire carrying a current comes into contact with a ground wire; with a grounded portion of a junction box; or with a grounded part of an appliance or device. Similar to a short circuit, large amounts of current are forced to flow through the fuse or circuit breaker, causing the fuse to blow or the circuit breaker to trip. Hot wires are identified by the color of the plastic coating on the copper wire: black, red, or white with a black or red tape wrapping. Neutral wires may be white or gray. Ground wires are usually bare copper but sometimes are green. A junction box is an electrical box in your walls or ceiling with a flat faceplate for safety. A loose connection on one of two wires in the junction box may cause a short circuit. A short circuit may happen in a box when a wire slips off of a terminal on an electrical device, such as an outlet. When it touches another wire, the circuit is shorted. An appliance may encounter an electrical problem and a hot wire and neutral wire may accidentally touch. Insects or rodents may chew the wire insulation and cause a short circuit between two wires that are within a cable bundle. Water leaking into an electrical box can cause a ground fault since water is a conductor of electricity. A ground-fault current interrupter (GFCI) is a standard outlet required by electrical code and is designed to shut off the current when there is a ground fault. A faulty GFCI that does not shut off may allow current to keep flowing and thus cause a ground fault. Worn hot wires or hot wires that are not completely seated into their terminals may come into contact with ground wires or grounding devices or boxes. Electrical shorts and ground faults can be caused by working on a circuit that wasn't turned off in the first place. Wires invariably will touch a wrong area, and either a short circuit or ground fault may result. To avoid, always be sure to turn off the circuit before you begin working on any section of it. Some fuses can only handle the current capacity they are valued at, like 20 amps for a 20-amp fuse. However, some fuses are designed to handle a temporary surge of current beyond their rating for a short period of time, called time delay fuses. These are great for appliances and motor driven devices that normally need a larger current to get a motor or pump turning, but then require less to keep them running. Thus this fuse suits the purpose well.